Advantages: Comprehensive, addresses all aspects of the Blackbird and its siblings. 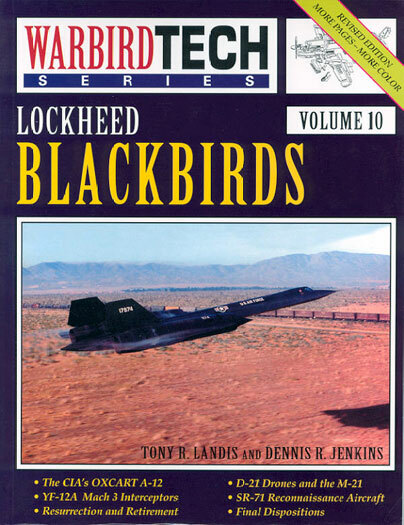 In 1997 Tony Landis and Dennis Jenkins wrote the first edition of this comprehensive history of the family of strategic reconnaissance aircraft made famous as the Blackbird. With the SR-71 re-entering US Air Force service in 1995 and not finally retiring until 1999, there was scope for a revised and updated edition of this volume of the Warbird Tech Series. By waiting before returning to the subject, the authors are now able to complete the story with more material and an increase in the colour content of the supporting imagery. No aircraft has a greater aura of mystery surrounding it than the Blackbird. With the first generation design dating back to a 1950’s CIA requirement to replace the U-2 even before that aircraft entered service, the Blackbird represents a pinnacle in aircraft design. It was able to fly higher and faster than any other air breathing aircraft before or since. 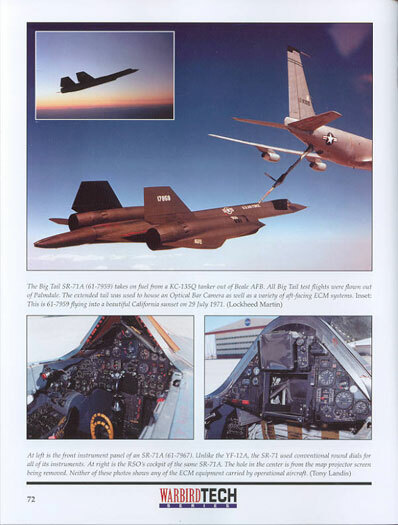 In this book the authors have ensured that all aspects of the story are addressed, from the first design studies that ultimately resulted in the A-12 (the first generation single seat aircraft) through the YF-12 interceptor program and M-21/D-21 drone carrier to the final expression of Kelly Johnson’s Blackbird, the SR-71. Along the way they provide detailed analysis of design, testing production and operation of all sub-types. Importantly they also lay to rest some old myths, such as the origin of the SR-71 designation, apparently correct and not the result of a slip by President Lyndon Johnson. The Blackbird family saw some interesting times and the authors seek to document them all. This includes not only CIA and Air Force operation, but also a detailed looked at the NASA research program than was aimed at supporting development of a Supersonic Transport (SST). Concluding the book are three useful appendices. These are where the reader will find the facts and figures including a final disposition list of all aircraft that could be described as Blackbirds, a useful glossary of the many acronyms that crowd the program and finally two pages with a chronology of key dates in the history of the Blackbird family from first flight of the A-12 in April 1962 until the last flight of an SR-71 in October 1999, an enviable record for any operational type. This Warbird Tech Volume is a very detailed look at the history and employment of the type, with numerous overall airframe photographs coupled with close ups of the cockpits and other areas useful to modellers. In this edition the reader is treated to a lot of colour photographs, which highlight how colourful some of these aircraft really were. It will prove a very useful volume for anyone who wishes to build a replica of the SR-71 or M-21 with kits available from a number of manufacturers in both 1/72 and 1/48. Better yet one is left in no doubt what is required to convert one of the current kits into a earlier A-12 or YF-12 for that something different. The book will serve both history buffs and modellers well. Recommended.